When there's no escaping the snow, it's time to make merry! 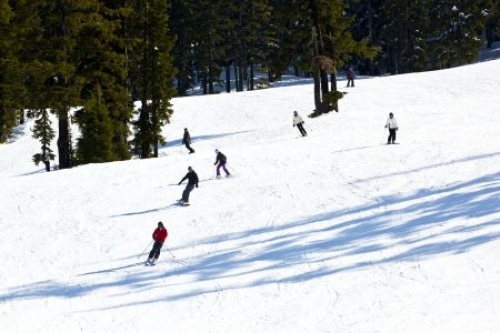 Manali, Feb 5 : Summer is for toil and winter for socialising. No one knows this better than Lahaulis, residents of Himachal Pradesh's picturesque Lahaul Valley. When there is no escaping the snow and the temperature plummets below minus 15 degrees Celsius, for the locals it is time to celebrate. Most festivals and rituals in the valley, which is normally cut off from the rest of the world for over four months from December owing to snapping of the world's highest mountain passes, fall during this time. Community fireworks add to the festivities that peak between sips of local barley liquor 'arah' and sessions of 'challo' (gambling). For the women folk, this is the time to engage in knitting and stitching. Heaps of snow on the frozen expanse become venues for igloo-building and archery competitions as well as solemnising of marriages and other ceremonies. "It is time for merrymaking when everything on the earth here freezes, but not our spirits," said octogenarian Lobsang Bodh, a resident of Keylong, located on the Manali-Leh highway. "When nothing germinates, social culture blooms in the valley," Bodh added. Keylong, the administrative centre and two dozen villages in its vicinity, are located 15,000 to 20,000 ft above sea level. They are currently experiencing bone-chilling cold of minus 15-30 degrees Celsius. Another octogenarian, Tara Chand, told IANS over the phone that in his village of Sisu, many marriage celebrations have been planned this winter. The birth of a child and a marriage in a family is a grand affair. "If a child is born or a wedding is solemnised in summer, the celebrations are held in winter and they continue for days together," he said. Chander Mohan Parsheera, another local, said Fagli or the yellow festival is the most important festival in Pattan belt of the valley. The festival marks the thawing of harsh winter. This year it falls on February 5. For Fagli, the houses are tastefully decorated and lit with oil lamps. Each house or a group of two-three houses in the village hosts a community feast with singing and dancing that go on through the day and night. "This is the best period to relax and socialise. Since we are free from work in the fields and collecting fodder for the livestock, we sit around and chat for hours while knitting and weaving rugs," said Heera Devi of Tandi village. The population in Lahaul-Spiti district is mainly rural, spread across 521 villages. The Lahaulis are mostly farmers and grow cash crops such as peas and potatoes. The valley's seed potatoes are in great demand in states like West Bengal, Bihar and Karnataka. Buckwheat is the staple food of the locals, most of whom are Buddhists. Barley, wheat and rice are also consumed as well as lots of 'chhang' (locally-extracted beer) and salted tea mixed with butter.